The first of the semi-finals at the Western & Southern Open in Cincinnati will be contested between the number four seed, Garbiñe Muguruza and the number 15 seed, Karolina Pliskova. In a first career match-up, Pliskova produced a fine display to topple Svetlana Kuznetsova in three sets, 6-3 4-6 6-2. 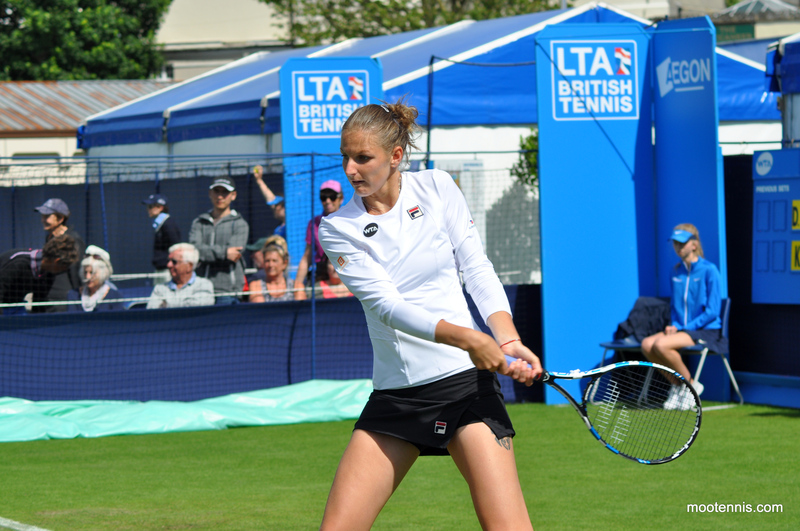 After splitting sets, Pliskova powered through the decider with two breaks of the Kuznetsova serve. Pliskova’s serve was once again a key factor; while she was serving at just 44% first serves in, when Pliskova did land a first serve, she dropped just five points behind it in the entire match. Furthermore, Pliskova was striking the ball beautifully and into the corners, pushing Kuznetsova’s defences to the limit. The Russian player had three break points in the decider but Pliskova was mentally strong and deservedly sealed the win in one hour and 51 minutes. Much like Pliskova, Muguruza played the big points better in her quarter-final match. The Spaniard defeated Timea Babos, 6-4 6-3. The match was closer than the scoreline suggested but Muguruza demonstrated her champion instincts, swiping away all three break points that she faced. Babos looked tired; despite the best efforts of her coach to find some energy and get her to use her brain (his words, not mine! ), Babos just came up short. Still, it’s been another encouraging week for the Hungarian player who enjoyed the best ever win on the WTA tour in the previous round against the world #11, Dominika Cibulkova. Ka. Pliskova makes only 44% of her first serves but hits 15 aces & her forehand is on fire. She blasts past Kuznetsova, 63 46 62. "Quick feet, strong stance," says coach Sam. Head-to-head record: Pliskova leads Muguruza, 2-1 in their head-to-head. Pliskova won both of their 2015 clashes in Dubai (6-4 5-7 7-5, SF) and Indian Wells (7-5 6-4). Interesting stats: Pliskova’s win over Kuznetsova in the quarter-finals was her best win on the WTA tour in 2016 in terms of ranking. The Czech player is into her fifth semi-final of 2016 and is bidding to reach her first final on hard courts this year. For Muguruza, her win over CoCo Vandeweghe in the second round was her first ever win in Cincy, snapping a three match losing streak at this tournament. Muguruza will be bidding to reach just her 7th WTA final. Final thoughts: After their fantastic semi-final in Dubai last year, Muguruza and Pliskova were widely lauded as the next stars to watch out for on the WTA tour. Pliskova has had her moments but it is Muguruza who has made the far more significant strides, winning her first Slam title at Roland Garros. Pliskova’s decision to skip the Olympics and opt for a two week training block has already looked to be a favourable move as she looks recharged and refreshed. Considering her heavy scheduling last year and at times, this year too, it is very encouraging to see. August 19, 2016 in Cincinnati, Ka. Pliskova, Muguruza, WTA. I’d love Pliskova to win and think she’s absolutely capable of it. Their difference in ranking comes largely down to Muguruza being much more successful in the Slams than Karolina. On a court like this & in an event like this, I think they are fairly even. Yeah, they’re both very good and hard-hitting players but Garbi seems able to win the big matches better than Karolina does; maybe it’s a confidence issue on Karo’s part? Could be two AWESOME semi finals!